Labor had a penchant for publicity. Their posters of monkeys in an art class drawing a Labor truss bridge bicycle became famous worldwide. Labor had considerable success in racing with their distinctive frames. Patented by Iver Johnson in 1900, the truss bridge design became popular in France as a result of world champion Major Taylor, who raced for Iver Johnson in France to escape prejudice in America due to his colour. Labor introduced their own truss bridge bicycle in 1906, copying Iver Johnson’s design, and the model continued through the 1920s. 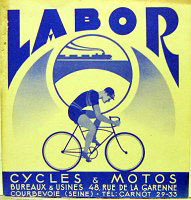 The illustration below shows Maurice Dewaele of Belgium, 2nd in the Tour de France in 1927 with his Labor. After World War One, the Labor chainwheel spelled out the company name. The original shop plate shows that it was sold by a cycle and automobile agent named Frederic Moder of Muttersholtz, Alsace, France.